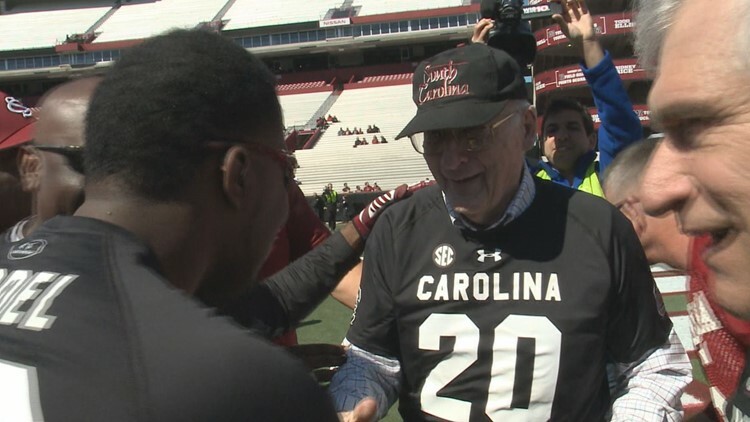 Former Gamecock All-American Lou Sossamon (20) is congratulated after he scored a touchdown in the 2014 Alumni Game prior to the USC Spring Game. Lou Sossamon, an All-American who played in the early 1940's, has died at the age of 97. Lou Sossamon, a member of the USC Athletics Hall of Fame and the South Carolina Athletics Hall of Fame has died as the age of the 97. The Gaffney native played center and linebacker for the Gamecocks from 1940-1942 and was named to the Associated Press All-America team in 1942, the first player in USC history to receive that honor. After his career at USC ended, he served in the Navy during World War II before eventually landing in the NFL. Sossamon stole the show at the 2014 USC Spring Game when he scored a touchdown in the Alumni Game.